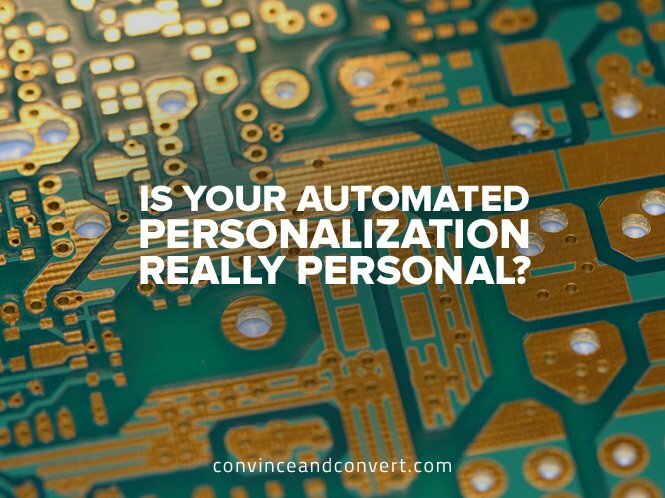 Is Your Automated Personalization Really Personal? It’s no great secret that the majority of our online connections are hollow. A Facebook friend directory in the thousands means mostly squat at the end of the day, yet we’re always looking to expand our network even if it means we’re further thinning out connections that are mostly surface-level to begin with. As we get more Likes, and the percentage of those Likers we’d actually want to get a beer with shrinks, we start to understand a cold truth: personalization doesn’t scale. As brands have tried harder and harder in recent years to become more human, they’ve run into the same problems of automating engagement. They want to be our friends, want to know everything about us, want to be there for us in the exact right moments—all elements of a more personal relationship. But how much personalized automation are we willing to put up with, especially when the illusion of personalization is usually shattered? Or even worse, when that personalization makes us feel bad about ourselves? Every company wants to engage, to be a “part of the conversation.” But how many of them are actually good at the listening part of that conversation? Sure, automated processes have made it easier to reach out with an email on a customer’s birthday. But what most automation doesn’t allow for are those surprise-and-delight moments that feel like real, organic communication. And people (who are more than just consumers, remember) are living in a “swipe right” world and can see right through your superficial message. It’s not shocking then that 60 percent of retailers expect zero ROI from supposed personalized communication. We’re hard-wired to react and understand physical connections. Humans can communicate 8 out of 12 emotions by using touch alone. Automated engagement can evaluate the last ten movies you watched on Netflix and still recommend a clunker. It’s unforgiving, and for users of technology, mistakes like this can be unforgivable. If a brand builds itself up to be one that “knows” people, and it serves them pointless or incorrect communication, that’s a deal-breaker. It’s not as if people don’t want to be communicated with by the brands they love—90 percent have interacted with brands in some way, usually on social. So why is it so hard to find the right balance of automation and customization when it comes to dialogue? As companies scale, they become further removed from the basics. During the early growth stages of a business, face-to-face communication and thoughtful personal interactions are a founder’s bread and butter. Business quickly grows because people feel important. Leads are always followed up with human touch. Then the pressure of the sale becomes real, and growing the stable of well-catered-to, loyal customers means hoping automation can cover some of the work founders and CEOs used to take on themselves. Pretty soon, you’re congratulating people on becoming new parents by mistake. Technology can be used to amplify about a fourth of the total engagement pie—anything beyond that, and people notice that a company is generalizing. Bad sales strategies bank on a strategy of confusion; they hope people won’t notice the automation. So a random post-download email disguised as a piece of authentic communication might get a click, but it’ll also enrage the receiver once they see how phony it is. When you take a step back, you realize that personalization is not rocket science. But it often is hard. And, it’s the little things that count. A handwritten note is special—people hang on to that stuff for years. It shows thought. A bulk email thanking someone for showing up to your webinar? That’s beelined for the trash. If you really think you know your customers, then you should know that appreciation for a personalized touch is universal. Personalization surprises people in this modern age because it interrupts the normal pattern. Smart marketers realize the psychological benefits of personalization and are finally beginning to merge the digital and physical worlds together. Physical APIs are becoming more commonplace and have become just as efficient as (and more effective than) sending an email. Marketers can call upon the data to segment and target individuals, then combine that with the knockout punch of a handwritten note or gift card. Personalized correspondence like this can increase response to a marketing campaign by 30 to 50 percent, mostly because it’s so old school that it seems revolutionary. And it scales. It wasn’t too long ago when the idea of brands communicating at all directly to their consumers was unheard of—the channels didn’t even exist to do so. Now, we expect every user experience to be customizable to fit our needs while expecting brands to converse with us in a way that feels completely natural. It’s not an easy ask for companies, granted. The ones that are able to walk the balance by automating to a point while still making us feel like they give a crap will be the real, almost human, partners we’re looking for.